The world's longest double-deck bridge system stretches into the morning mist over the Seto Inland Sea. From the viewing area on Yoshima Island, under the centre span of the 13.1-kilometre colossus, you can see vehicles whizz by on the upper storey, trains on the tier below, and a dreamy expanse of islands and sea once ruled by pirates of the formidable Marukami clan. In fact a series of six bridges, the Great Seto Bridge took 10 years and billions of dollars to build, connecting the islands of Honshu and Shikoku for the past 31 years. It is a monumental start to day three of Botanica World Discoveries' 12-day Cherry Blossoms, Culture and Sights of Japan cruise, which has brought us to Takamatsu, a provincial capital of 400,000 people famous for its udon noodles. It is located on the north-eastern coast of Shikoku, the smallest of Japan's four main islands, sitting like a jigsaw piece between Honshu to its north and east, and Kyushu island to the west. Takamatsu in turn is in Kagawa, the smallest of Japan's 47 prefectures. And as though our day is a matryoshka doll, things are about to get smaller still as we climb back on to the coach at Yoshima Island and head for Kinashi Bonsai Village. This fastidious style of potted-tree rearing, I am to learn, originated in China, although Japan has thoroughly stolen the miniature-plant spotlight. 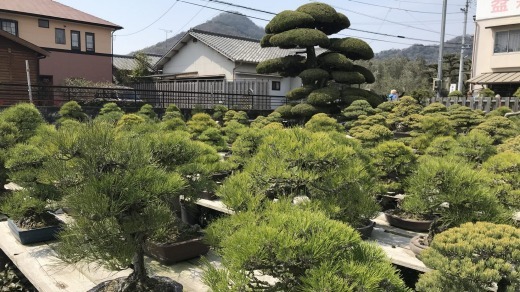 They have been growing bonsai in Kinashi for more than 200 years and the dozens of family-owned nurseries here, on Takamatsu's western outskirts, produce more than 80 per cent of Japan's pine bonsai. 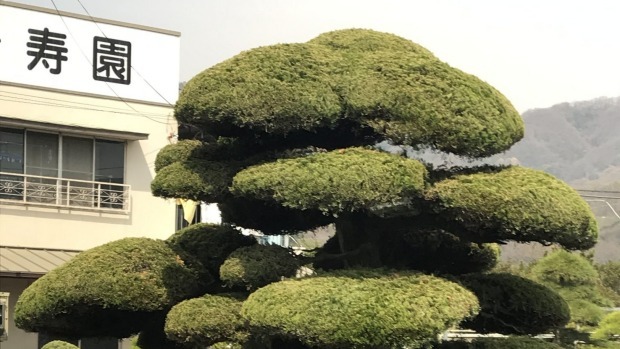 The plants are exported to Europe, Asia and the USA but many stay in Japan where the pine tree symbolises longevity – in their bonsai form they can live for hundreds of years, and are passed down through generations of families. When we arrive at the nursery of fourth-generation bonsai master Keiji Kandaka, his son Kohei – his face hidden to us by a mask and low-brimmed straw hat – is standing over a work bench pruning the roots of a 70-year-old de-potted pine bonsai. The trunk is thick, squat and gnarled and attached to a disc of soil which is being snipped and scraped at with a series of utensils. The silver-haired master looks on intently, stern-faced and arms folded. He doesn't let just anyone into his nursery, our tour leaders tell us; Botanica is an exception "because he knows we love gardens", says Julie Prent, one of two expert gardening guides on the trip. The pruning speed is fast. Tools clink and pine needles shiver. Up to two-thirds of a bonsai's root system will be removed like this every three years. Otherwise, the master explains through a translator, the tree will not thrive. This bonsai, which father and son proceed together to carefully repot, ensuring its position in the ceramic tray is precisely right before the gravelly potting mix goes in, has a price tag of $US5000. Given it takes 10 years of "training" the plant before a bonsai even goes into a pot, and then decades of work to ensure roots flourish while the tree above is kept small, the price tag seems reasonable. Root surgery complete, we see the stages of bonsai evolution on a stroll through the nursery, from rows of seedlings in the ground to Kandaka's most prized tree, a 300-year-old black pine bonsai that belonged to early-20th-century prime minister Okuma Shigenobou. It's barely a metre tall – in the wild, the evergreens can grow to 30 metres – and asymmetrical in the manner highly valued by the Japanese. "It is the highest excellent one," the translator says. This cruise may be designed to inspire gardeners, but cultivating a bonsai is not for the faint hearted. One passenger of a certain age wryly notes that they've left it too late to consider growing one. 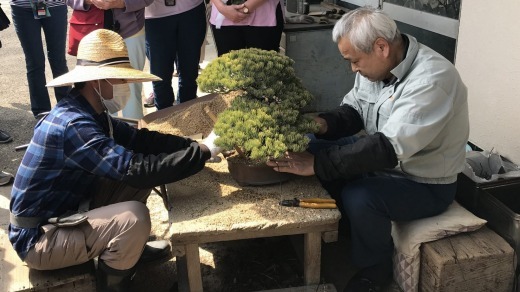 "It's a long-term commitment to have a bonsai," says professional gardener Simon Rickard, the second of the cruise's expert guides, during an on-board lecture a few days later. "People in the West think it's like torturing a tree, but the plants don't feel it as torture, it just directs their growth. "So many decades of work go into them that you don't want them to die, you want to give them the best possible love available." Sarah Maguire travelled as a guest of Botanica World Discoveries.